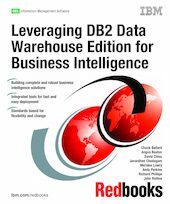 In this IBM Redbooks publication we describe and discuss DB2 Data Warehouse Edition (DWE) Version 9.1, a comprehensive platform offering with functionality to build a business intelligence infrastructure for analytics and Web-based applications, and best practices for deployment. DB2 DWE integrates core components for data warehouse construction and administration, data mining, OLAP, and InLine Analytics and reporting. It extends the DB2 data warehouse with design-side tooling and runtime infrastructure for OLAP, data mining, InLine Analytics, and intra-warehouse data movement and transformation, on a common platform based on DB2 and WebSphere. The platform pillars are based on the technology of DB2, Rational Data Architect (for physical data modeling only), the SQL Warehousing Tool, Intelligent Miner, DB2 Cube Views, and Alphablox. DWE includes an Eclipse-based design environment, DWE Design Studio, that integrates the DWE products (with the exception of Alphablox and Query Patroller) with a common framework and user interface. The new SQL Warehousing Tool enables visual design of intra-warehouse, table-to-table data flows and control flows using generated SQL. DB2 Alphablox is the tool for developing custom applications with embedded analytics-based visual components. DWE enables faster time-to-value for enterprise analytics, while limiting the number of vendors, tools, skill sets and licenses required.